Relationships! Relationships! Relationships! - Ryan Sheehy bares his soul and shares his journey. 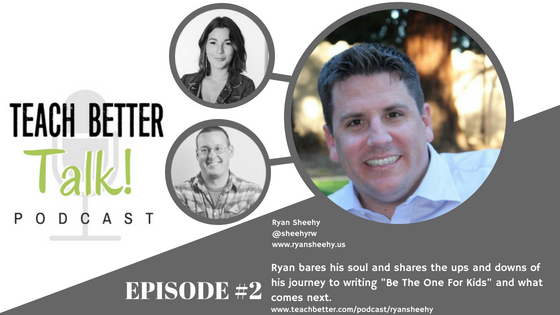 Author of "Be the One for Kids"
In this episode, Ryan Sheehy, elementary principal and author, bares his soul as he shares the ups and downs of his journey to writing “Be The One For Kids” and what comes next. Ryan shares what “failing harder” means to him, the story of signing Eddie’s soccer ball, and one very important, final message for every teacher out there. 5:25 – Where “Be The One For Kids” came from. 6:15 – Ryan’s journey to writing a book. 9:27 – What Ryan hopes the book will give you. 14:37 – Eddie’s soccer ball, and believing in Nuvia. 21:04 – What Ryan is most excited about in education. 25:05 – 6 questions in 15 seconds or less…Ryan rocks it! 28:13 – Ryan’s final words for you. Daily/Weekly/Monthly Routine: Connecting with students about things outside the classroom. Also be active on social media and never stop learning. Best piece of advice you’ve ever received:Relationships, Relationships, Relationships!